Do you see the above picture my dear readers, that was taken in my garden yesterday Saturday October 1st and we were having a BBQ! In Yorkshire, in October! It is an absolute miracle and I am stunned. We have had an enormous heatwave here in the UK – it has been so so warm so Jake and I decided to make the most of it and BBQ for tea. And afterwards I sat out watching the embers glow, drinking a little red wine with no coat on till 8pm. Oh if only Autumn could always be like this! 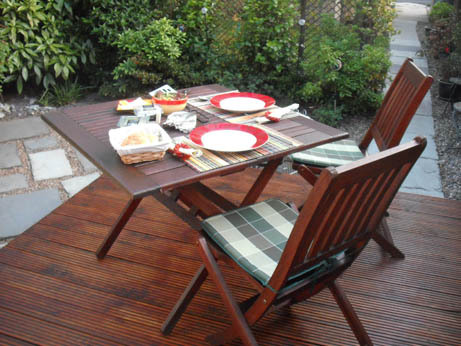 I hope you have also noticed the beautifully restored decking – isn’t it nice the way it matches the chairs so well. It had got very scruffy so I found a very nice gardener man to come and pressure wash, sand a re-stain it for me so it is all looking lovely. Jake and I had a very lovely visit yesterday to Stafford for the University Open Day there. We were very impressed, it is a pretty town with a park and canal and a very lovely campus. The course and lecturers were also very good and there was a great welcome from everyone we met. He has to fill in his choices form soon and then fingers crossed he will be offered some places! I have had a ridiculously busy week again, we had another Marsden Jazz Festival meeting (things are hotting up as the festival is next weekend! ), went out for a meal with work friends which was very nice and had the girls round for the evening. And there was work which was very busy but very nice – I am having a lovely time with my new group. All this of course means very little craft time so apologies for only WIP pictures again. I have finished one of the Little Cotton Rabbits wristwarmers and cast on for the other one last night and am nearly finished with my latest Xmas ornie. I was stitching this on our train journey to and from Stafford which was a very pleasant way to spend a few hours. 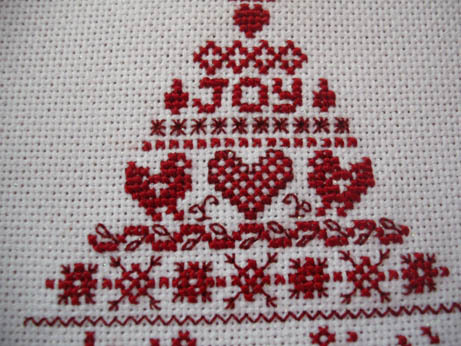 This is a pattern from the Christmas 2011 issue of Cross Stitcher magazine, I have stopped buying cross stitch mags generally as I have a few (ahem!) patterns still to do but was very taken by the prospect of more ornies and they had some lovely Scandinavian style ones (and a free ornie kit which I have sent to Ellie). I am stitching this on very fine count sparkly evenweave (think it is about 28 count) with only one strand of Silk Mill thread and all the backstitching and contrast rows are being done in a dark red sewing cotton it is that small-scale! I am very pleased with it, will change the bottom of the design I think and put another heart in and then make it up as a hanging ornie for the tree. The images below from the Cross Stitcher web site show the original design made up as a picture and also some very cute little bird ornies which I will also make for my tree. Well I hope that you all have a lovely week ahead – I am spending the whole of next weekend in Marsden for the Jazz Festival (yippee!!) where I will be running the box office. Hopefully we shall have some lovely weather so if you are in the area do come along, lots of wonderful music and a great time guaranteed!